[FTW can't cover everything. But when we get wind of an especially egregious bit of journalistic villainy, we like to smack the bully in his smug face. Here, a brave investigative reporter named Liam Scheff went undercover in a clinic that houses orphans; he discovered extensive medical abuse and an embittering disregard for the wellbeing of the kids - including force-feeding of drugs whose toxic side effects were already acknowledged by the manufacturers. Anybody who knows the stories of authoritarian medicine from Tuskegee to Auschwitz will recognize the smell of moral death here. What you're smelling is the perilous mixture of bureaucracy, technology, and racism that marks the nadir of human activity - it is the worst we can do. If that sounds harsh, read Scheff's original report, "The House That AIDS Built." In the July 17, 2005, piece titled "Belated Charges Ignite Furor Over AIDS Drug Trial," by Janny Scott and Leslie Kaufman, the New York Times seemingly accuses journalist Liam Scheff of having fabricated the findings of his report regarding the forced drugging of Black and Latino children at the Incarnation Children's Center (ICC). Despite their multiple known and admitted toxicities, these drugs were administered through tubes surgically inserted in the children's stomachs. Your claim that there is no "official evidence" presented in Mr. Scheff's reports is simply false. "Patients should be informed of: the possibility of severe liver disease or skin reactions associated with Viramune that may result in death." "Severe, life-threatening and in some cases fatal hepatotoxicity [liver damage], including hepatic necrosis [liver death] and hepatic failure, has been reported in patients treated with Viramune." 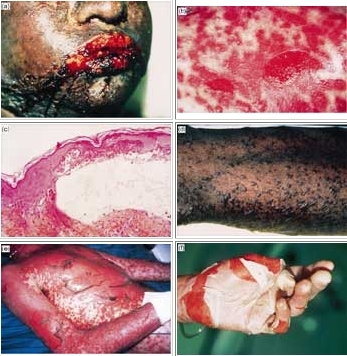 "Severe, life-threatening skin reactions, including fatal cases…have included cases of Stevens-Johnson syndrome, toxic epidermal necrolysis [skin death]…"
A baby with Steven-Johnsons Syndrome. SJS can be caused by Nevirapine. Steven-Johnsons Syndrome or Toxic Epidermal Necrolysis related to Nevirapine. In fact, all of the drugs given at ICC have known toxicities which the manufacturers themselves admit. This is most certainly true for AZT, whose side effects are amply documented in the medical literature: they include liver swelling, severe anemia, muscle wasting, fat degeneration, and blood toxicity, all of which appear on the manufacturer's label. Mr. Scheff interviewed ICC's medical director, Dr. Katherine Painter, where she stated that inserting a surgical tube into a child's abdomen to force them to take drugs is done "when other interventions to help a child take a medicine by mouth have failed." So when the children don't want to take drugs with known toxicities, a surgical tube forces them to ingest them against their will. The Times states that Mr. Scheff "claims" children are being "force-fed" drugs. This is not a mere claim by Mr. Scheff; it is confirmed by the medical director of ICC. Tube-feeding drugs directly into the stomach is certainly a form of "force feeding," especially if there is no parental consent. Mr. Scheff also interviewed Nurse Jacklyn Herger, who had worked at ICC throughout the 90's. She adopted two HIV positive children from ICC and confirmed to Mr. Scheff that it wasn't until she took the two children off the drugs that their health started to improve. Herger concluded that the drugs "not only weren't helping the girls, they were making them ill."
She also confirmed that ICC had been conducting clinical trials since the early 1990's. ICC is always conducting multiple clinical trials, as was confirmed by Dr. Katherine Painter in an interview with Mr. Scheff. Thanks to Mr. Scheff's report, the Department of Health and Human Services Office of Human Research Protections investigating the clinical trials on Black and Hispanic orphans at ICC has found that the National Institutes of Health (NIH) and Columbia Presbyterian Hospital acted unethically. All this is happening despite the fact that there is little evidence that the trials were anything but a medical success. If there were nearly 400 children at ICC who were 'unknown' because their documentation was "in the basement," can it honestly be said that we know how many of them died in 2000 when the overwhelming majority didn't even have an accessible file? Many of these children were orphans. If they died, few people outside of ICC would be likely to learn of it. Would it be in ICC's interest to cover up such deaths? Still, you feel very safe in stating that, "many (at ICC) said they remembered no fatal reactions." But a source told Mr. Scheff that two children at ICC did in fact die while Scheff was investigating the Center. He shared that source's name with you so that the Times could follow up with due diligence, but that does not seem to have happened. Why no mention of this? To repeat: you were given the contact information for the source of Mr. Scheff's claim regarding the two deaths. Did you attempt to contact that source? Perhaps the Department of Health and Human Services Office of Human Research Protections will be able to conduct a proper investigation and determine once and for all who is telling the truth here and who has a hidden agenda. It seems the position of the Times is that Black and Latino children were indeed forced to take drugs with known toxicities against their will, but that this was done for their own good. "Early in the [AIDS] epidemic, HIV disease of childhood was considered to be a downhill course leading to death. But in the late 1980's, before AZT was available, many very ill children admitted to ICC got dramatically better with proper nurturing and high quality medical and nursing care." If ICC has documented this, then why in God's name are they now forcing toxic drugs into the stomachs of Black and Latino children in Washington Heights, NY? Cui Bono? NY Times To The Rescue! Just when you thought that those poor folks at the NIH and Columbia University could find no one to stick up for them for using orphans in clinical trials….Here Comes The New York Times! So, Are Columbia University and the NIH the good cops for offering AZT to orphans through no-chewing-required tubes? Or, am I the bad cop for blowing the whistle on forced-surgery on orphans as part of AZT and Nevirapine Trials? Thanks for covering the Incarnation Children's Center story. You might have showed a little bias in your reporting, however. If I didn't know better, I'd say from reading what you wrote that I, Liam Scheff, independent journalist, somehow managed to get everyone who covered the story - the Alliance for Human Resource Protection, the New York Post, the UK Observer, and the BBC - all to dispense with their fact-checking and research departments and take my 'word' for what I discovered at ICC. That's quite a remarkable story. I'm sure you'll stick to it, but it's far from true. Your piece claimed that I presented no 'official evidence' in my reporting on Incarnation Children's Center. In fact, I've presented piles of official evidence - NIH clinical trial documents, drug manufacturer's package inserts and warning labels, multiple citations from the Physician's Desk Reference, NIH and FDA policy papers on the use of wards of the state - to name a few. You wrote that I made claims in my article about the death of two children at ICC. I was reporting from sources, one of whom I made available to the New York Times reporters after they interviewed me. I stand by that claim, and those sources. You generously quoted Dr. Stephen Nicholas on the helpful nature of AZT in preventing mother-to-child transmission of AZT. You didn't, however, bother to quote the medical literature. There are several studies on AZT and transmission. The NIH study Nicholas quoted (ACTG 076) is the only one with a significantly favorable outcome. Other mainstream studies on AZT rate it similar to or worse than placebo or no treatment regarding maternal HIV transmission (for a list of citations on AZT see http://www.aras.ab.ca/azt.html ). You also omitted reporting on the consistent downgrading of AZT (also called Zidovudine) in the medical literature - from "life-saving AIDS drug" to a drug which actually increases the rate of disease progression and death in children born to mothers who were given AZT. There are so many contradictions in the medical literature regarding AZT and other AIDS drugs, you have to work hard to ignore them (find a few below). Finally, you did not mention that I interviewed the medical director of ICC Dr. Catherine Painter, who told me, in no uncertain terms, how the medication regimen would be enforced if a child was unable to swallow pills which tend to cause abdominal distress (vomiting and diarrhea). The method, I was told, is a surgery to implant a gastric tube into the abdomen of these children, for the purpose of strict adherence to the drug regimen. It's one thing to say that AZT is a life-saving drug and that these orphans have been treated with the highest standard of care. It's another to print it as fact in the pages of the New York Times, without reporting the significant evidence to the contrary. Instead of digging to the roots of this story, you have instead successfully colored it against further investigation in your pages. And that's a shame for people who think you really are the paper of record. Finally, survival probability was lower in children born to ZDV+ [AZT treated] mothers compared with children born to ZDV- [no AZT] mothers. " Rapid disease progression in HIV-1 perinatally infected children born to mothers receiving zidovudine monotherapy during pregnancy. AIDS. 13(8):927-933, May 28, 1999. "Children of study women who were prescribed ZDV [Zidovudine, AZT] had increased adjusted odds of any anomaly…[T]he lack of data on potential adverse effects of this therapy is still a concern…. Babies whose mothers had ZDV [AZT] exposure during pregnancy had a greater incidence of major malformations than those whose mothers did not. " Newschaffer CJ et al. Prenatal Zidovudine Use and Congenital Anomalies in a Medicaid Population. J Acquir Immune Defic Syndr. 2000 Jul 1; 24(3): 249-256. ZDV [Zidovudine, AZT], in particular, alters mitochondrial metabolism and may have direct nutritional effects "
Miller TL et al. Maternal and infant factors associated with failure to thrive in children with vertically transmitted Human Immunodeficiency Virus-1 infection: the prospective, P2C2 Human Immunodeficiency Virus Multicenter study. Pediatrics. 2001 Dec; 108(6): 1287-96.